This book is literally the best thing since sliced bread. I was a little apprehensive about artist Francis Manapul pulling both art duties and co-writing (despite the fact his online site shows a LONG love of the character), but the results make this title the biggest home run of the new DC. While the Flash legacy seemingly disappearing is a sour note, Francis and co-writer Brian Buccellato step right in to a tale that not only produces one of the finest double page spreads in pop culture illustration, it masters the medium by nailing the little human moments that make Barry breathe as a character. Sure it's while he faces a hit squad backed by an army of clones of his childhood friend - but hey that's what makes it tick. 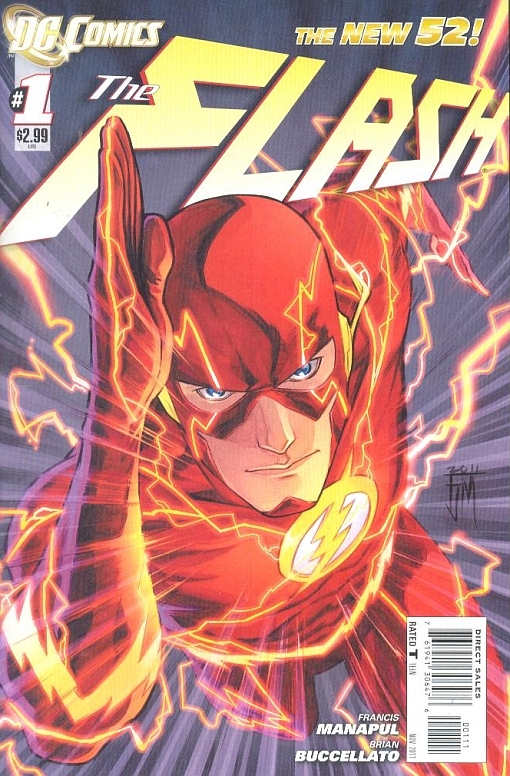 I've said before Barry Allen's adventures made me want to be a forensic scientist right up until the age of 14. Here the CSI aspect of the title proves just as addictive, along with a great new power where Barry can analyse a scene at light-speed and you can try and predict how he will put all those random elements together, before reading what he actually does do on the following page. It fits and it's fun. 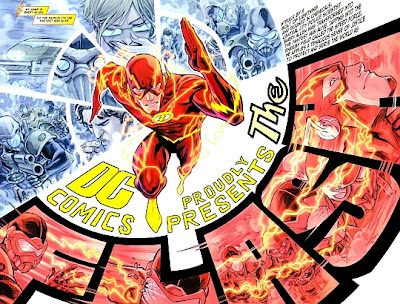 New twists, great characters and buckloads of art that blends design with straight out pure talent, means this could just be the best Flash run of all time (especially if they can bring Wally back - hint hint). ***** Locked in - Highly, highly recommended. My top title of the 52. 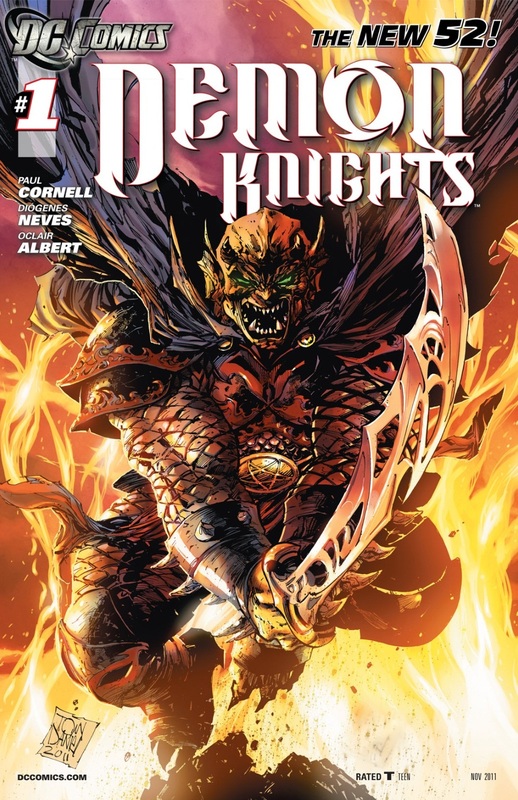 Jason Blood and his demonic alter-ego Etrigan, are one of DC's best concepts and not surprisingly a Kirby one at that. Add the immortal Vandal Savage to the mix and Demon Knights creates a medieval based title that perfectly fills an aching need in mainstream comics for more damned good sword and sorcery adventure. The detailed art of Diogenes Neves really helps capture the era perfectly and his dragons are beauties to behold. Written by Paul Cornell, who has a Midas touch for comics, the only slight downside to this book for me is that Etrigan no longer rhymes. I know it can come off as cheesy at times, but I'm sure Paul has the chops to make it work. Jump on board now as the humour and drama of the horde of the Questing Queen smacking into the Demon's burgeoning 'fellowship of the ring' is just beginning, and you'll be assured a great title that is completely different from anything else out there today. Meet the all new 'Maid of Might'. Where Clark crashed in Kansas, she crashed in Siberia and she's none too impressed with her frosty reception. 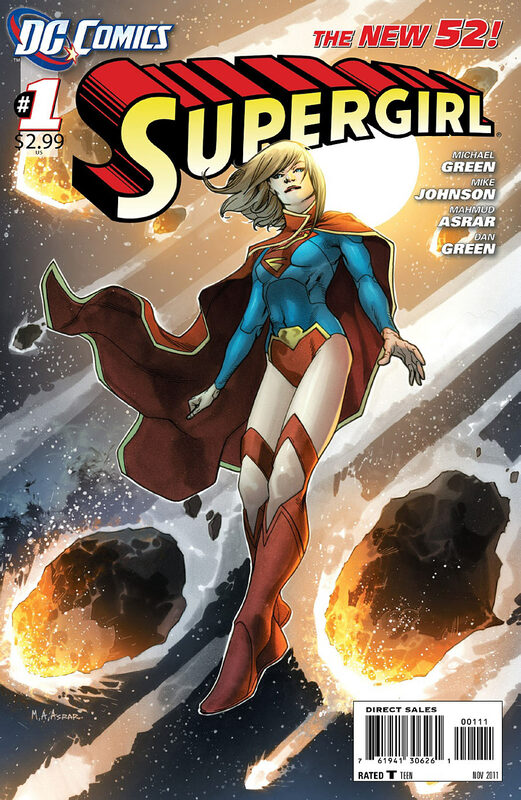 However, as Kara deals to the soldiers sent to 'greet her' and her gate-crashing cousin, not much else happens in Supergirl and that's kryptonite to a new comic. Writers, Michael Green and Mike Johnson have nailed the thoughts and emotions of a bewildered and lonely Kara, but just like artist Mahmud Asrar, whose new style ranges from on fire to being light on detail, backgrounds and looking unfinished in parts, we could do with a little more. This is pretty rhetorical. It's a dream gig all the way around and it's yet to slip up. 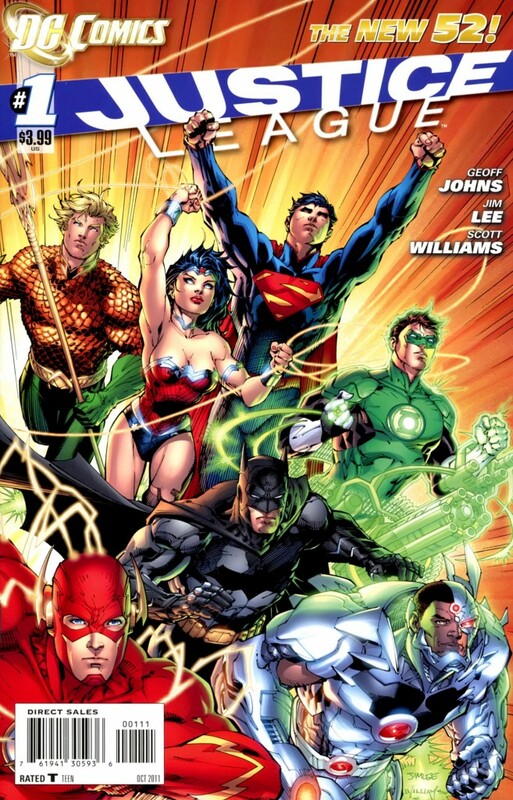 Cyborg's made the League, Scott Williams is inking, the characterisation between the 'Big Six' is bang-on given their respective rebooted histories and the League's first villain is suitably Darkseid. Oh yeah 'Johns' and 'Lee'. The duo's work already reminds me of those sweet Super Powers comics which came out to support the Kenner toy range of the same name, and in my books that's pretty high praise indeed. Verdict: ***** Locked in - and well worth the wait. 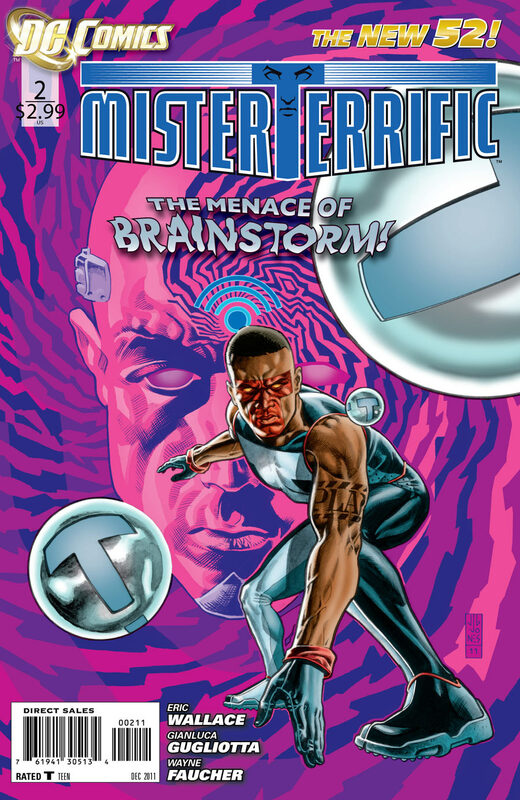 Sporting the best costume redesign of the 52, Mr Terrific is the little book that could. Michael Holt is the world's third smartest man and as the menace that is Brainstorm starts unleashing peoples true feelings and views, Holt whose brain usually beats science has to now find a way to turn those tables around. Humanised by the unbelievably real dialogue of writer Eric Wallace, Michael's only two real releases from stress are Karen Starr (aka the late Power Girl) business comrade and confidante, and the T-Sanctuary, his pocket dimension getaway. Overall Mr Terriffic is a great, long over due shot at fame for this character, so if you're looking for a solo title that will deliver, here's your hit pick to click. Verdict: ***** Dropped - Right on the wire, but just can't fit. Ooooops! Er, I mean 'Australia'. That's really bad isn't it... Sorry! Haha, true Robert it is a little like confusing Americans and Canadians, but now I'm a dual citezen of sorts, so I'm happy either way. Glad you're liking the reviews... Just keep my wallet in your prayers now you know the price tag a little bit more shipping mileage creates! that is a lot of $%&@*)! money for a comic book. especially these day with how one can read em faster then the time it takes to take a piss. it wasn't like that in the 80's and early 90's. but i still think it's bullocks that you dropped Suicide Squad Dan ya bugger. in particular with Boomerang jumping on board. ol Digger might throw a razor rang your way an lop off your bleed head. however, this may make for a fun posting idea using your infamous head shot, stay tuned. by the way Dan i saw your comment on the ROM blog this morning and i beg to differ. i bet after a few Fosters in ya even horse face chicks might start lookn alright to ya mate. i got something special comin fer ya mate real soon now and that's not the pig's arse! gulp! all right mate - lookin' forward to seeing what you come up with. You're right on the nail with the cost of comics though. Here any movie over two months old almost is 10-15 bucks as a DVD. so I can get two comics of a film with 3 hours of cool. To me comics have massive advantages over film, but if they're not careful comics will suffer just by a high price tag in comparison, let alone anything else.